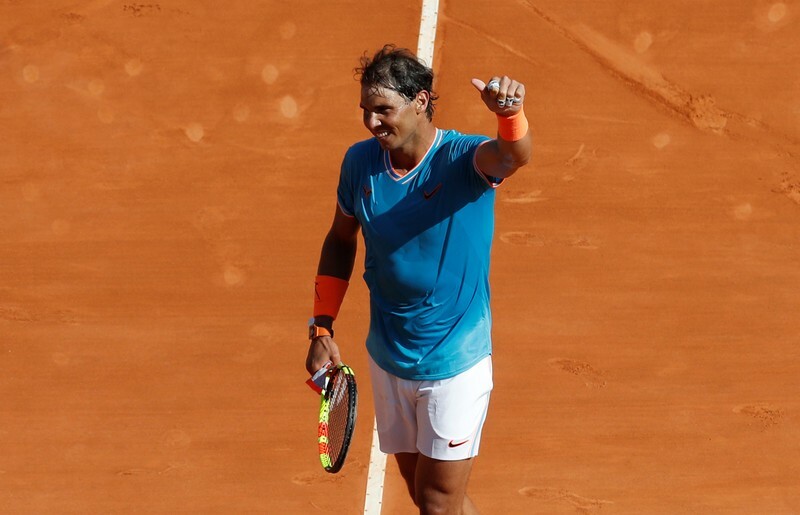 (Reuters) – Rafa Nadal produced a claycourt masterclass to pick apart fellow Spaniard Roberto Bautista Agut 6-1 6-1, as the world number two began his Monte Carlo Masters title defense in stunning fashion on Wednesday. Bautista Agut did get on the board but Nadal clinched the opening set and put his opponent under further pressure with another break of serve at the start of the second. There was no stopping Nadal who regularly moved Bautista Agut out of position, opening the court up effortlessly with powerful forehand combinations. After saving three break points at 2-1, Nadal displayed his clinical side at the net to secure a 4-1 advantage and went on to claim a convincing win. The 11-times Monte Carlo champion extended his winning streak to 16 matches at the tournament and will face Bulgarian Grigor Dimitrov in the third round. “It was a great start, it’s good to be back here,” Nadal, the 17-times Grand Slam winner, said. German hotshot Alexander Zverev showed signs of a return to his explosive best in a 6-1 6-4 win over Canadian teenager Felix Auger-Aliassime. Third seed Zverev, who lives in Monte Carlo, reached the semi-finals of his ‘home’ event a year ago, but has endured a difficult 2019 season. After finishing runner-up to Australian Nick Kyrgios in Acapulco, Zverev has suffered early exits at Indian Wells, Miami and Marrakech. “This is the first time this season I’ve felt really healthy,” said the 21-year-old. Last year’s French Open runner-up Dominic Thiem won 20 of his 23 first-serve points in a commanding display to beat Slovakian Martin Klizan 6-1 6-4. Greek sixth seed Stefanos Tsitsipas also progressed, defeating Kazakh Mikhail Kukushkin 6-3 7-5.